The judicial commission of inquiry into state capture continues with testimony related to Bosasa from former SIU lead investigator Clint Oellermann, followed by testimony from the commission's investigators. #StateCaptureInquiry Zondo says there must be proper justification before investigators go into people’s houses, enter their bedrooms and take pictures. “I think it’s not right,” he says, adding things should be properly done and always under the legal team's advice. Mlambo says he called Mr Mti to inform him that they are in front of his house. He says Mti was not happy that he was never informed prior to the inspection. 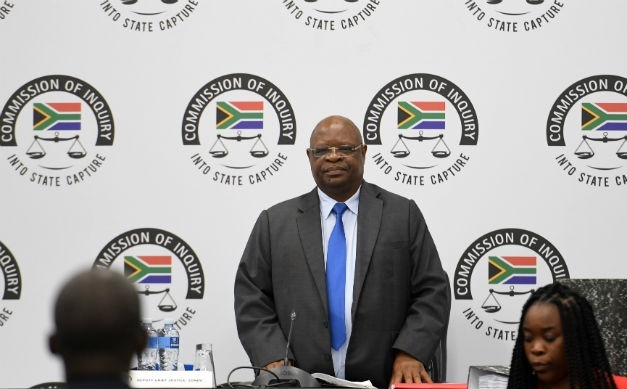 #StateCaptureInquiry "At least, they looked like the ones as we installed," says Mlambo reporting what Le Roux told him at the Greenbushes, Eastern Cape property regarding the fencing and lights. #StateCaptureInquiry Mlambo says he does not recall the value of the property. Zondo asks if the property is registered under "Mtimkulu" or "Mti" and Mlambo says he will have to refer back. Molefe moves on to another property, visited on 18 February 2019. Mlambo says Le Roux indicated that they also installed energizer and it was placed in the garage. #StateCaptureInquiry "I had to go on what he says," says Mlambo in reply to Molefe's question on whether or not the electric fencing had any distinctive features. Molefe refers Mlambo to another annexure. This, says Mlambo, shows the LED perimeter light. Mlambo says the first inspection took place at a property associated with "Linda Mthimkhulu" in Colchester in the Eastern Cape. Mlambo later refers to the person in question as "Mr Mti". Mlambo says they inspected the property of Mr Gwede Mantashe and Linda Mthimkhulu in the Eastern Cape. #StateCaptureInquiry Mlambo says that former Bosasa employee, Richard Le Roux accompanied him to various properties which were being inspected by the inquiry. Mlambo is one of the investigators working with the commission. Back from the break, Pretorius addresses Zondo to let him know that the next witness, Patrick Mlambo, has testified before, but now returns with further testimony. Mlambo's testimony will be led by Advocate Refilwe Molefe. Mlambo is now sworn in. Pretorius concludes his line of questioning, and Oellermann is excused. Zondo thanks Oellermann and reminds him that he may be called back to the commission if they require anything further from him. Pretorius requests a short adjournment before they proceed with the next two witnesses, which Pretorius says could span several hours. Zondo grants a 15-minute adjournment so that the legal team can prepare the next witness and the related evidence bundles. Oellermann says that the SIU was aware of other suspect contracts/tenders awarded to Bosasa by the Department of Correctional Services, but they fell outside the proclamation, and as such did not form part of the investigation. Pretorius says the SIU evidence is failry concentrated and reasonably clear. Can there be any rational basis for a delay of 10 years? Pretorius moves further along in Oellermann's statement. Oellermann says the findings listed in the SIU report were compiled based on the information they received and analysed. Pretorius asks Oellermann about the investigation into former correctional services chief financial officer, Patrick Gillingham, and undue benefits he may have received. The SIU report asserts that Gillingham received benefits months before an access control tender was awarded. RELATED - Gillingham to Bosasa bosses: Mercedes Benz, please! Oellermann says when SIU investigators undertook the process of imaging the Bosasa servers, over 7 000 documents (on one server) appeared to have been overwritten and deleted. Oellermann tells Zondo it concerned him that it seemed as if Bosasa had an "inside track" on the SIU investigation and as an investigator he had suspicions of delaying tactics, when there were delays on the search and seizure raids on their offices. Oellermann reveals that Bosasa approached them and said: "We understand that you want to come and do a search and seizure on our premises..."
Zondo: Initially you intended to carry out the search and seizure on a particular day? Zondo: And you were asked not to proceed? Oellermann continues reading from his statement, regarding the details of the leaked SIU report. Back from the lunch break, Pretorius continues leading Oellermann's evidence. Zondo calls for the lunch adjournment. Proceedings resume at 14:00. Pretorius establishes with Oellermann that anyone who leaked the document to Bosasa at the time, should have known that it could harm prosecution. Oellermann agrees. New life for Bosasa prosecution after 8-year delayhttps://t.co/ySMxmfVMOH? #StateCaptureInquiry Oellerman now details a meeting where Adv. Simelane briefed former Minister of Justice, Jeff Radebe, former Minister of Correctional Services, Nosiviwe Mapisa-Nqakula and other officials at the DCS about the SIU report into Bosasa. Oellermann says Simelane's comments caused one to lose momentum and it meant more delays. #StateCaptureInquiry Oellermann now reads Adv Simelane's response to Adv. Breytenbach. Pretorius now continues leading Oellermann's evidence. Back from the break, Zondo addresses the issue of the woman who unexpectedly approached him just after he called the adjournment, pleading for Zondo and the commission's assistance with information that she has in her possession regarding an SOE and her late husband. #StateCaptureInquiry Back from tea. Before we proceed, Zondo says: "I just want to say something about the lady who sought my attention when I was adjourning. Zondo calls for a short adjournment. Back at 12:15.